This biography of Marcus Clarke was written a century ago by Cyril Hopkins, brother of Gerard Manley Hopkins and a close friend of Clarke, and is published now for the first time. Drawing on memories of their schooldays together in Highgate and Clarke’s letters from Australia, Hopkins gives a fascinating picture of the mercurial immigrant’s ups and downs as he moves from banking to jackarooing, before emerging as a controversial journalist. 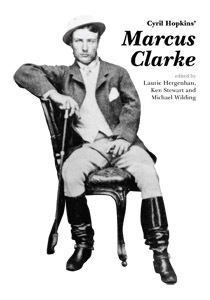 Clarke’s career as theatre critic, bon viveur, librarian and author of the classic novel His Natural Life is vividly and movingly captured, along with the bustling and variegated character of a colonial city, the outback mining towns and the remote unexplored bush.